Re: Voices: Where are the women among Texas Baptists? I read your recent article with a mix of joy at seeing the subject discussed and a bitter taste in the back of my mouth as I recalled key moments from my own experience as the husband of an ordained Texas Baptist woman whose entire vocation has been devoted to mentoring ministers in the work of pastoral care. As the proud spouse of a woman in ministry—who was named a top leader in her large healthcare organization and who offers amazing ministry at work and at our church—I’m often disappointed in the response Texas Baptist leaders have to women in ministry. Leaders in our denomination continue to pass on her gifts and the gifts and talents of ordained women, in general. 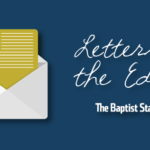 More disheartening is the fact Texas Baptist leaders often do not show any reluctance to express their fear of upsetting people who do not support women’s ordination, doing so in front of the women they are supposedly affirming by offering them a token place at the table. Just being asked to serve is not enough anymore. Texas Baptists have to create genuinely welcoming environments going beyond the tepid, ambivalent atmosphere too often created, where there always seems present the assertion that some huge sacrifice has been made to create a place for women at the table. If we don’t, we will continue to see the drain of a tremendous fund of talent that could help us be even more effective in reaching our current age with the gospel.